Being close to the end of the Summer, August is typically known for its consistently hot and dry days. However, for the last 27 years, it has also become synonymously known as National Eye Exam Month. Considering the danger to eyes of the sun’s UV rays, in 1989 Sears Optical founded National Eye Exam month. They did this in an effort to raise awareness of the importance of eye health and safety. The idea quickly took off and today ophthalmologists all across the nation promote eye health throughout the month of August. Like many illnesses and diseases, the risk of vision problems significantly increases the older we get and catching it early on greatly increases your chance of solving them. A recent study found that 6.5 million Americans over the age of 65 suffer from severe visual impairment. Furthermore, it is predicted that by 2030 these rates will more than double. Even if you feel like you have strong vision, experts recommend that once you are over the age of 40 you should have your vision checked every 2-4 years. In addition, once you are over the age of 65, they recommend every 1-2 years. A study conducted by Prevent Blindness America, a national volunteer eye health and safety organization, found that the four leading eye diseases affecting older Americans are: age-related macular degeneration, cataracts, diabetic retinopathy and glaucoma. Over the next few weeks, we will explore each of the eye diseases and how you can lower your risk of contracting them. This week we will discuss macular degeneration. Age-related Macular Degeneration (AMD) is the leading cause of impaired vision among people over the age of 50. According to the National Eye Institute, the condition damages “the macula, a small spot near the center of the retina and the part of the eye needed for sharp, central vision, which lets us see objects that are straight ahead.” While AMD doesn’t cause complete blindness, many sufferers must rely on peripheral vision. This can greatly interfere with everyday activities. Although often unavoidable, there are several lifestyle changes one can make to lower the risk of AMD. To lower you or your risk, quit smoking, exercising regularly, maintain normal blood pressure and cholesterol levels and eat a healthy diet rich in green veggies and fish. 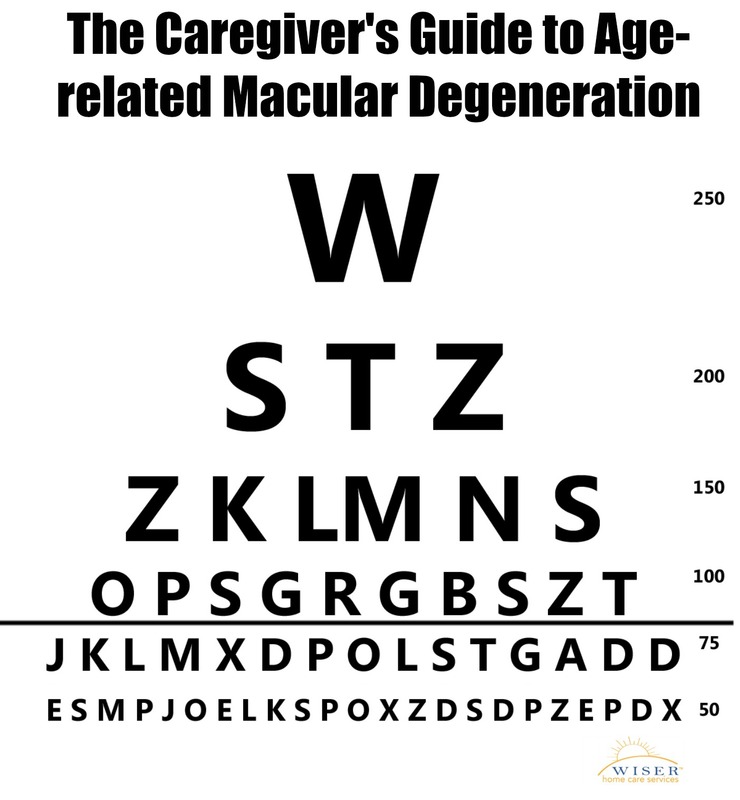 There are three stages to Age-related Macular Degeneration: early, intermediate and late. AMD usually starts without symptoms and the only way to detect it, is with a comprehensive dilated eye exam. If you have AMD, the doctor will determine what stage you are in based on the size and number of drusen under the retina. Unfortunately, there are currently no treatments for early stage AMD. However, researchers at the National Eye Institute have found that nutritional supplements can help protect against intermediate AMD. If you care for an elderly loved one who suffers from AMD and would like help caring for or developing an extensive care plan, we can help. We will be happy to answer any questions you may have.